Mary Bagot Stack (12 June 1883 – 26 January 1935), known as Mollie Bagot Stack, founded the Women's League of Health & Beauty in 1930, the first and most significant mass keep-fit system of the 1930s in the UK. This has continued as an exercise system into the 21st century. After an education at Alexandra School and Alexandra College, Dublin, she enrolled in 1907 as a trainee teacher at Mrs Josef Conn's Institute of Physical Training in London. She had met Mrs Conn in Paris and was inspired by her specialisation in exercises to promote health. By 1910 she had moved to Manchester and set up her own fitness centre with private classes, large classes for women factory workers and also treated private patients. "Seal" posture from Building the Body Beautiful, the Bagot Stack Stretch-and-Swing System, 1931. It closely resembles Salabhasana, locust pose, an asana in modern yoga. In the 1920s she again began to hold classes, initially for children in her own home, and by 1926 was training teachers in her own system at the Bagot Stack Health School in Holland Park, London. This initially involved 12 sequences of exercise designed to train the body in accordance with the seven principles of the Bagot Stack System. There were classes for women and children in dance as well as exercises. Her inspiration for developing her own exercise system came from a short time in India, where she observed the differences in movement between women wearing constricting Europeans clothes and those with looser Indian clothing. She had also studied hatha yoga on her travels in India. She developed a series of exercises based around her belief that movement was essential in life. This also fitted with ideas developing across Europe at the time of the benefits to women of exercise and changes in clothes fashions. As well as involving vigorous group exercises, the classes were designed to be sociable, which benefited the many recently bereaved women. Her big innovation was to move from small, private classes to a mass-market movement. In 1930 this grew into a commercial enterprise, the Women's League of Health and Beauty, using the YMCA's Regent Street premises. Public displays in London garnered publicity, and more centres started in 1932 in Bromley, Southend, Slough, Bournemouth, Croydon, Birmingham, Glasgow followed by Ayr, Paisley and Edinburgh and finally franchised centres all over the UK. The Women's League of Health and Beauty classes included elements from dance, callisthenics, and remedial, slimming, and rhythmical exercise to music. The League published its own magazine, Mother and Daughter, from 1933 to 1935 with content on pacifism and feminist political discussion as well as general self-improvement. 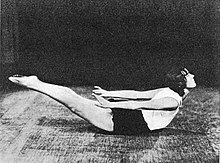 Her book Building the Body Beautiful - The Bagot Stack stretch-and-swing system was published in 1931. The organisation has been described as the most popular female physical culture organization in Britain. The league adapted eugenicist terms and saw women as "natural race builders". Their aim was to promote "racial health" through physical exercise. The organisation grew rapidly so that by 1934 there were 47,000 members but this had grown to 166,000 in 1937. Her daughter Prunella, along with others, continued promoting this exercise system so that the (now called) Fitness League  movement continues as a national fitness programme in the UK. Mary Meta (Mollie) Bagot Stack was born 12 June 1883 in Dublin to parents from the Irish Protestant professional class. Her father was a dentist, Richard Theodore Stack (d. 1909). She contracted rheumatic fever at the age of 17. She married in 1909 (Albert Thomas James McCreery, a doctor) but this was short-lived ending in divorce. She married again on 10 March 1912 to a third cousin, Edward Hugh Bagot Stack (1884 - 1914), a captain in the Gurkha Rifles, who was killed in the First World War. She travelled with him to India, living in Lansdowne, a hill station near the Himalayas, but returned to the UK at the outbreak of war with her newborn daughter. She died in London 26 January 1935, aged 50 after suffering from thyroid cancer. Her first child died at birth in 1913. The second, Ann Prunella, was born in India, 28 July 1914. ^ Singleton 2010, p. 143. ^ a b "Student Teacher/Trainer Contract" (PDF). EMDP Training together. Retrieved 17 January 2015. ^ Horwell, Veronica (2 January 2011). "Prunella Stack obituary". The Guardian. Retrieved 17 January 2015. ^ "The Fitness League History". Fitness League. Archived from the original on July 29, 2009. Retrieved 17 June 2014. ^ Bagot Stack, Mary (1931). Building the body beautiful: The Bagot Stack stretch-and-swing system (1 ed.). Chapman and Hall. p. 71. ^ Zweiniger‐Bargielowska, Ina. (2005). The Culture of the Abdomen: Obesity and Reducing in Britain, circa 1900–1939. Journal of British Studies 44 (2): 239-273. ^ Garrity, Jane. (2003). Step-daughters of England: British Women Modernists and the National Imaginary. Manchester University Press. p. 67. ^ Childs, Martin (1 March 2011). "Prunella Stack". The Independent. Retrieved 17 January 2015. ^ "The Fitness League". Retrieved 17 January 2015. Singleton, Mark (2010). Yoga body : the origins of modern posture practice. Oxford University Press. ISBN 978-0-19-539534-1. OCLC 318191988.